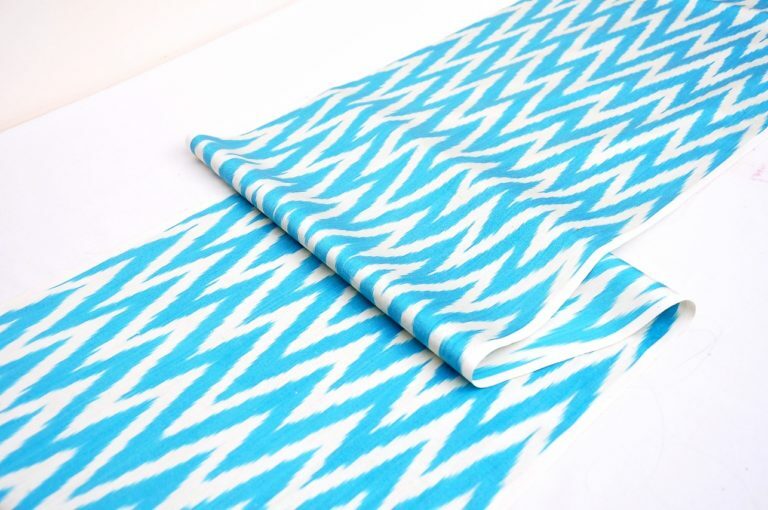 Technique of making ikat is by nature conservative. A production process is difficult to change; habits must be broken and many adjustments made. The easiest way of lowering the cost of a fabric was by varying the number of dye baths to which it was subject. 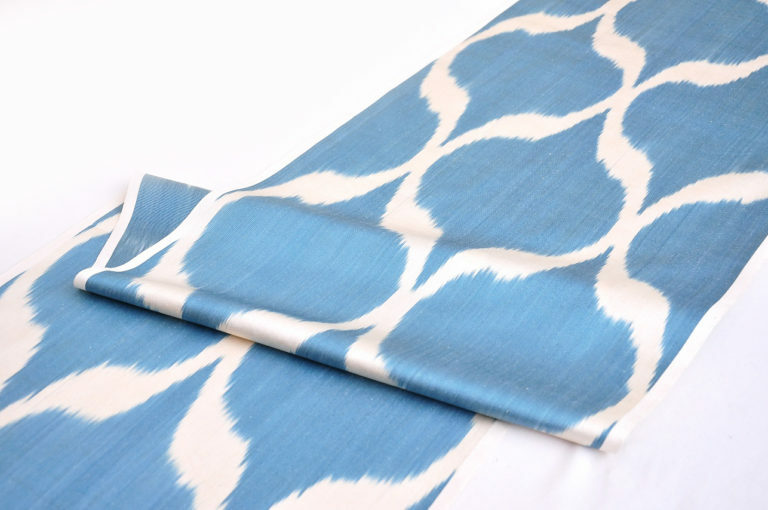 The introduction of chemical dyes resulted in a dramatic change in both ikat colors and the handling of pattern. Chemical dyes were officially banned in Bukhara until the twentieth century, but could easily have reached dyers within the Emirate through unofficial channels after the late 1860’s. The oldest adras ikats appear to be the finely detailed fabrics with a white field and tiny spots of color, and the equally complex adras of mottled blue/green background and highly saturated color. These two early design types have the richest tones, the least fabric width, and consistent, small bundles, and they are also the rarest of the Central Asian ikats that remain. Main Central Asian textiles use only the natural browns and white of the raw materials to from striped and geometric patterns, but understandably brighter colours have always been widespread. Traditionally dye is applied to spun yarns, whether wool, silk, cotton, linen or bast fibres, and only more rarely to woven fabric. Fleece is dyed before felting. Wowen cotton cloth is block-printed with dyes, There is a mystique attached to dyeing, and the skilled dyer has always been held in high esteem by the community. Dye-recipes were sometimes kept secret within a family or workshop and passed down over the generations. Colors play a symbolic role, particularly for textiles used in rites of passage and other ceremonies. Over such a vast region there are considerable botanical variations, and often particular dye-substances or mordants are specific to the textiles of tribes which frequent an area. In the fertile areas, for example, black is obtained from pomegranate peel, boiled together with iron filings, while in more remote areas, pistachio or a plant of the species Malvaceae, locally known as karachup, provides tannin required to fix black from iron to yarns or cloth. Dyeing, like weaving and embroidery, has always been an exclusively female craft in the nomadic population. Young girls learn their skills and the tribal motifs and patterns; but dyeing, as the most elaborate of the processes applied to fleece or yarns, is the last skill to be accomplished. In the villages and towns, before the industrial revolution of western Central Asia in the 1930s, the craft of dyeing was organized in small workshops with a master craftsman and three of four helpers, usually young relatives. Particularly in western Central Asia, different methods of dyeing were practiced by the various ethnic groups. Dye workshops which require a source of heat were run by Tadjiks and Chala Muslims, former Jews converted to Islam, while the cold indigo-dyeing was performed exclusively by Jews. A few traditional dye workshops can still be found. Most of the space is occupied by a row of clay hearths with copper cauldrons, one for each dye, and further cauldrons contain alum solution for use as a mordant. Deep blue indigo-dyed fabrics with thin, white, branching patterns in adras technique make their appearance by the middle of the nineteenth century. The importance of the indigo fabrics as mourning robes ensured their longevity in the local marketplace. Information from numerous ethic studies made in the early twentieth century indicates that these indigo-dyed ikats were considered proper attire for older women in many areas of Central Asia. The wide distribution of Jewish indigo dyers throughout Central Asia would have made production of dark blue ikats possible in any of the ikat-making cities. The ikats with indigo background continued to be made in adras until almost the end of the century, with only a slight loss of color saturation and tone, while brighter fabrics were increasingly made in all-silk plain weaves and satins. 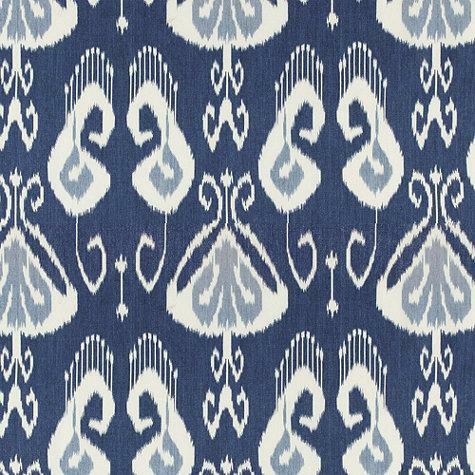 The simple, narrow patterns of the ikats with an indigo background are not found on adras ikats in any other color range. The plant Indigofera tinctoria from which the blue dye indigo is extracted does not thrive in the dry climate of Central Asia, and blocks of the prepared dye-stuff have long been brought to the area by the caravans from India, and also from Kabul, which was famed for its production. An indigo-dye workshop, where heat is not needed, is chiefly occupied by large clay vessels, khums, buried in the ground up to the neck. To ten pails of water are added powdered indigo, slaked lime, iron vitriol and dried mulberry fruits. Twelve or fourteen vats are generally made up, and four are used in sequence, each vat containing a different strength of indigo. Those not in use are tightly capped to exclude air. The yarn is dipped in the vat, drawn out and left to oxydize, when the blue colour develops. The more often this is repeated, the deeper the colour. A method of fermentation dyeing with indigo is traditional for the Ersari Turkmen tribe. For this, a handful of wheat sour dough and sheep or ox bone-marrow are pounded together and put in a vat of water with powdered indigo. The yarn is first soaked in water and barleymeal and then immersed in the vat, which is covered and left outside to ferment in the heat of the sun for fifteen days. Should the dye not be deep enough, more bone marrow and sour dough are added, and the yarn is left to steep for a further period. This entry was posted in Home + Decor, ikat fabric, Lifestyle. Bookmark the permalink.